He acted very suspicious and strange the last couple of weeks, and then one evening he dropped down to one knee, almost as if he’s about to tie his shoe. But then he lifts his hand with something very shiny in a black box in his hand! The adrenaline takes over, and perhaps a tear or two start to form in the corner of your eye. He mumbles the speech he has been preparing for over a year, but is shaking from the nerves, and perhaps he gets that all of a sudden higher pitch in his voice. 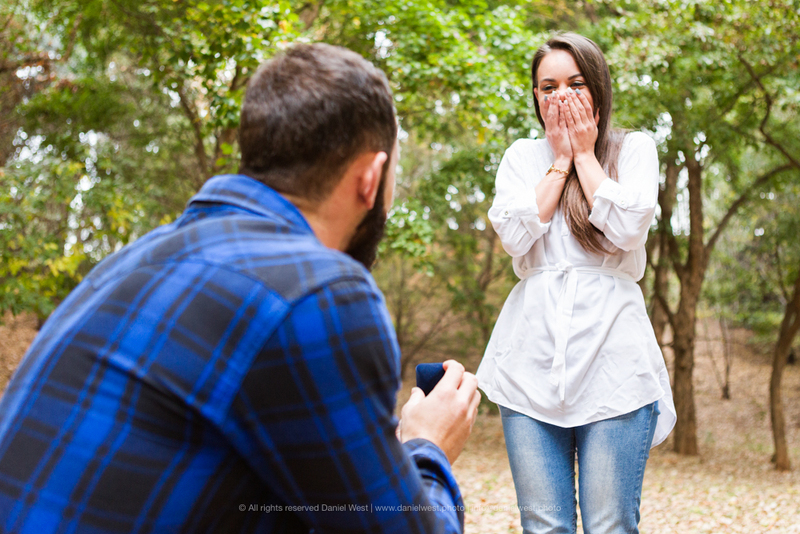 It’s a blur, but you do remember saying “YES” and now you have a new shiny accessory on your ring finger! But now comes the planning, and time to get that scrap book you’ve had all these years to work! Dress, Venue, Flowers, Cake, Guests…What’s missing? The Photographer! It doesn’t help your spending so much time and effort, and not have a brilliant photographer to capture it all! After all everyone say that wine gets consumed and flowers fade, but the memories need to last forever! So how do you choose the perfect photographer? Choosing the right wedding photographer is probably one of the most important decisions you can make regarding your wedding day, not only will the photographer need to capture those fleeting moments perfectly, and be in your personal space the whole day, but also he/she would need to think on their feet and solve problems should they arrive. Having a photographer who is, not experienced, or does not have backup equipment, may lead to disaster. The decision is also a very personal one which is not easy. There are a few guidelines to help you on how to choose your wedding photographer; that perfect wedding photographer, because as mentioned… it really doesn’t help your spending tens of thousands, and not have it captured perfectly. You’ve seen all those beautiful dreamy photographs on fearless photographers, Facebook, Instagram, and even Pinterest. And now you have to make a decision on what you personally like, what resonates with you. as each photographer’s style and approach to weddings are different. There are 2 main approaches in wedding photography; Photo journalistic / Documentary, and Portraiture. Photojournalistic / Documentary focuses more on the let things happen naturally. This style is very popular, and also a great way of getting those candid shots of you and your bridesmaids popping the champagne, or perhaps granny gets the need to do the Macarena, believe me you want to have this on camera. Its where the photographer does not intervene in any proceedings during the day, and capture the moments exactly as they happen, un-stylised. Portraiture or Styled is basically all dependent on what the photographer tells you what to do, how to pose, and where to stand. This style is normally used within all the approaches for the couple shoots. It is mainly dependent on the guidance of the photographer. A style of a photographer can only be seen through the body of their work, there’s “Dramatic and moody”, “Airy and flairy”, “Abstract”, “Artistic”…and the list goes on. You will need to have a look at the entire body of work of the desired photographer, and decide for yourself, what resinates with you, and what will last you decades. A wedding is fast paced, and a lot happens during the simple 10 hour wedding, with many challenges. For example: What happens when it rains on your day? What happens when there’s minimal light in the chapel? Or if someone runs late, say the pastor runs late…what now? now everything runs late and you only have 15-30minutes to shoot your beautiful couple portraits before the sun fades away? All of these situations has happened to me before…How to handle these situations, and more, only comes from experience, only an experienced photographer will know how to achieve the best possible result from these wedding situations. You deserve the best! You really don’t want to leave this special day in the hands of a fly-by night photographer, or a relative who does photography only on weekends. Do your Homework on the choices you have. Nothing beats reading reviews and hearing how other clients have experienced the photographer’s services, are they award winning photographers, do they have a great reputation in the industry and outside? Many photographers only show case their best shots on their website, So ask about full weddings, and see what the quality is for a whole delivered wedding. Also be wary of any studio/photographer who shoots more than 60 weddings a year; This can lead to them outsourcing other photographers (as a studio), or deliver poor quality due to split attention with too many weddings they need to concentrate on, you really deserve nothing but the best. By getting a few quotes you will be able to see what types of packages wedding photographers offer; Some offer a limited amount of hours with a few hundred edited photographs, others offer albums with each package, and others engagement shoots. Discuss with your husband to be what you personally would like in a package. Most photographers offer tailor-made packages to suit your need, so don’t be afraid to ask for it. Setup a meeting with the preferred photographers, and ask them to bring a sample of their work, an album they give to clients works best, as you’ll get the feel of what the album quality is, and also how the design, and story telling of the album progresses. You don’t want to have your album come apart after a year or two, due to poor craftsmanship. Aslo consider a package with an engagement shoot, as it is an ideal time to practice those Greece Lightning poses for the wedding day. It is vital to be comfortable with the photographer, as he/she will be with you and your soon to be husband for the entire day, in personal moments, and perhaps a blooper moment or three. One can immediately see when a bride and a groom was uncomfortable with the photographer in the photographs afterwards, and I’m sure that you definitely do not want that! So arrange a meeting with your top selection of photographers, and meet them in person, or over skype. This way youll be able to see if you’re a match or not. I truly encourage meetings, not only do we get to know each other personally, but it allows for a time to ask any questions which might be dwelling on the mind. Such as; How many hours do they spend on post production per wedding? How long would the turn around time be for the final product? Do they have backup gear, do they backup their weddings on more than one hard drive? Great photographers get booked up really fast, and even years in advanced. So Make sure that you act fast when you have found that perfect photographer. It saddens me every time I have to say I’m unfortunately already booked for their wedding. Some brides has even try to bribe me to take their wedding instead! But once a wedding is booked and secured that date is out of the question. Now all that remains is to have fun on your wedding day, take a deep breath, sit back, relax and off to the next arrangement. Remember that your wedding day should be everything you dream it to be, and more, because you deserve the best. So have fun, enjoy every moment…because out of first hand experience. It sure flies by really fast.